Needless to say, my having designed the logo did not mean I condoned what I soon felt were some serious mistakes made in the name of Palestine, such as the targeting of innocent civilians. In a spirit of disillusionment I left Beirut for good, and emigrated to Japan where I limited my activities for Palestine to designing posters, giving talks, and the like, devoting myself to my art and inventions. I had met both Kamal Nasir (the cousin of my brother-in-law) and Ghassan Kanafani. Once in Ramallah Kamal with his wonderful spirit, urged me to follow my dreams whatever the cost. Both he and Ghassan were assasinated by Israeli agents in Beirut, in 1972 and 1973 respectively. Their political work ended with their deaths, but their great novels and poems live on as a treasured part of the Palestinian cultural heritage. In 1976 my father obtained a permit to allow me and my family to visit him my mother and sisters in Ramallah then under Israeli occupation. On the bridge on the Jordan River I was arrested by the Israelis and detained in Jerualem for three days, where I was questioned about my above-mentioned activities then released. After three months I was not allowed to renew the permit to be in my own homeland and had to return to Tokyo. X abbreviated the Fath to an 'F' with an Arrow, adding in Arabic "Towards Victory Always - Long Live Palestine!" The final PFLP logo in outline. May 1969. Ghassan Kanafani, spokesman of the PFLP in his Beirut office around 1970 just as I remembered him. I went there on business related to the Palestinian refugee children's drawings book In Time of War, Children Testify. The finalized symbol is pinned on a map pf Palestine. To the left is the circular version which became the standard. In 1970 I was asked to design this medallion or key-holder. 36 mm diameter. A news item from AlHadaf the official PFLP magazine edited by Ghassan Kanafani. November 1969. "A NEW SYMBOL FOR THE POPULAR FRONT. 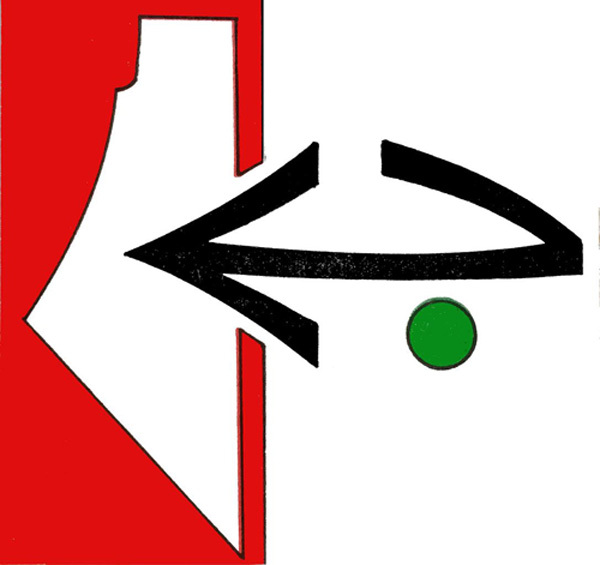 The new symbol for the Popular Front of the Liberation of Palestine, as it appeared recently in a number of places. It consists of the letter 'J' ending with an arrow thrust forward, towards Palestine." Now, 47 years after designing the PFLP symbol, the enthusiasm and wrath of those years is a distant memory. Nevertheless, the symbol itself is still very much in use as I discovered via a simple Internet search. The logo helps keep alive the spirit and hope of liberation, reminding us of the necessity of regaining our own homeland. It is still used at rallies attended by thousands, waved at funerals of those who have given up their lives to the cause - often as a result of mistreatment or hunger strikes in Israeli jails, and scrawled on the Separation Wall eating up our beloved Palestine from the inside. Palestinian girls attend a Popular Front rally in Gaza in 2015. Note how they added a ^ mark to the symbol, for the letter Sheen in Shaabiyya- Popular. Right, the official symbol as it is distributed digitally from the group's website. My original outline of the logo have become slightly distorted, for example the horizontal line lost its subtle curvature. A poster announcing the martyrdom of university student Saji Darwish shot by Israeli troops near Ramallah in Palestine in 2014 after a rock-throwing incident.